I have a Box with European Nightcrawlers standing in my yard for 2 months now. The adult worms seem fat, fast and strong and they eat and mate actively. As a result I had a nice amount of baby worms crawling in that box, but now I find only halves of that baby worms. Some dead, sticking on the walls, like they tried to escape, and others still living and struggling in the bedding. 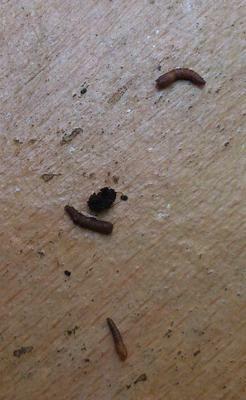 So I dug a bit more to see what lives in this box besides my worms, but only found brown and white mites. There where Ants in the bin for a day maybe 2 Weeks ago, but at that time the young worms where still unharmed and I immediately took measures like raising the moisture and moving the box to a higher place where not that many visitors come by. I would appreciate any help, because I can't tell what eats halves of my baby worms, but would prefer to be able to at least protect the next ones. Also, I made some pictures. Hello thank you for your submission and your concern for your worms. Earthworms do have a lot of natural enemies and quite a few of them can regularly be found inside well established worm bins. 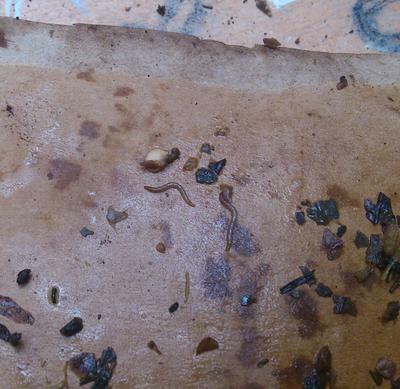 Centipedes are very common in worm farms and like to feed on smaller worms they can overpower. Slugs are apparently as well keen to devour a worm if they can get hold of it. Both slugs and centipedes would need some time to eat a whole worm and might hide if they get disturbed while feeding? Usually natural predators of compost worms like Red worms or European Night crawlers will consume the whole worm and not just parts of it. In all my years as a commercial worm farmer I have never experience half eaten baby worms like those you shared in your pictures. I would suspect that there maybe might have been some kids involved who wanted to test the old myth that both ends of a worm cut in half will survive!? Which is of course not true! It is not nice to loose worms but a well run worm farm will usually produce plenty of baby worms and will be able to compensate for the loss of a few immature worms. Please keep me posted if you find the culprits? Ok, now I fed my worms almost nothing since the last post. Only a few raspberrys when the big worms were already really thin. Should I just keep feeding them minimal amounts of food and wait what happens or do I have to pick the worms out and set a new farm up for them? The dead rotting babies may contribute to the problem as someone has to eat them too. I try to pick them out (trowing them in the raised bed so the living ones even get a chance there ;)) but it's impossible to get all of them. Yes, only baby worms get eaten and try to escape. Though they don't get far, as they are only halves of babies. There are no traces that any bigger worm tried to escape. I gave them shredded paper as a bedding, but mixed some soil in it. They ate some tea and coffee at the beginning, but now I give them only the "good" food (like fresh fruit and vegetable leftovers except citrus and onion/garlic, sometimes I add eggshell powder), because there is more kitchen waste than the worms can eat anyway. The big worms wanted to crawl out the first nights, but after that none of them even tried. By the way, there is one single worm that didn't grow with the others, as he escaped in the first night and I only found him about a month later. He got half eaten too. Now it's a really short worm, but also, his tail grew back a little. your problem is really puzzling and unusual. One thing though is the fact that you mentioned that worms are trying to escape from your worm bin! This is usually a clear indication that worms don't like the conditions inside their bin which has quite often to do with a raise in acidity inside the bin! What kind of materials did you use as bedding and what kinds of food do you add to the worm farm? As far as I understand you said that there are only baby worms that get eaten and that try to escape from the worm bin. Is that correct? Please keep us posted and I truly hope you will solve that problem soon. The worm farm is out of reach for children. Beside that, I would have found traces if anyone big were involved. There are only 3 worms on my picture (because it's hard to see all that worm-suffering), but there are probably hundreds of them in the box. If I remove the dry bodies of these that tried to escape, there are 10 new ones the next day. Also, I haven't seen a single healthy baby worm for a while now. I thought about centipedes, as they may be fast enough to remain unseen, but can't imagine why they would leave half of each worm either. How many centipedes would it take to kill hundreds of little worms anyway? It seems strange that I can't see any of them if there are that many. I'll tell you if I find the culprit.